At Global Basecamps, we don’t blink when we call ourselves travel specialists; we are well-traveled all around the world, and consider ourselves real experts on our featured destinations. But our commitment to extreme local knowledge and unparalleled customer service keeps our “Featured Destination” list at a manageable fifteen countries, until now. Global Basecamps has spent years planning successful, cultural, exciting and unique trips to Argentina. From Buenos Aires to Ushuaia, Argentina is a cavalcade of dramatic landscapes. The romantic capital city is the most European city outside of Europe, with a modern, eclectic collection of industries and people. Every week, Buenos Aires makes a published Top 10 List of one type or another. Most Colorful Cities, Best Cities For Singles, Most Cultural Cities, Most Beautiful Cities, etc. There is no overstating the importance of including Buenos Aires on your list of places to see in South America. Our custom Argentina tours would be sadly limited if we kept you in Buenos Aires. 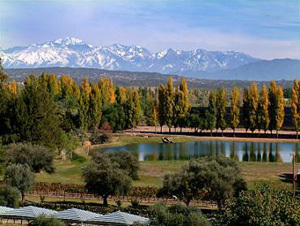 If you consider yourself a wine-lover, Mendoza should be on your list of destinations here. We are honestly concerned we’ll never hear back from our clients once they learn about this place. A seemingly quiet, sleepy town, this modern, fun city comes alive at night when its bars and cafes open its doors and begin pouring drinks. The atmosphere is laid back, the avenues are wide and the comforts are plenty. It is also the base of operations for Argentina’s booming wine industry, and a great place from which to explore its world famous vineyards. El Calafate acts as a gateway to a gallery of Argentina’s nature. 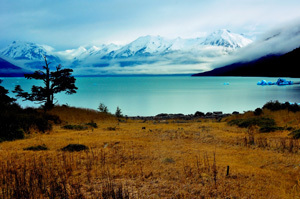 Patagonia is a slideshow of peacefully quiet meadows, untouched rivers and clear night skies. The jagged peaks of Torres del Paine will leave you dumbstruck. The Perito Moreno Glacier near El Calafate is the largest advancing glacier in the world, and a ton of hiking and trekking around its mass is a popular activity. El Calafate itself is a charming village transformed by tourism into a bustling town with travelers from all over the world come to sample some of Argentina’s pleasures. If Buenos Aires is the South America’s Paris, Bariloche is its Switzerland. Outdoor sport abounds in this Lake District city. During winter, snow coverage on its soaring mountains is perfect for skiing and snowboarding, while the summer sees hikers, mountain bikers and horseback riders arrive in droves. Still not convinced? Bariloche is also Argentina’s chocolate capital. We’ll just leave it at that. There seems to be no end to Argentina’s natural wonders, and each is more epic than the last. Iguazu Falls is a long collection of around 275 separate waterfalls that drove Eleanor Roosevelt to exclaim “Poor Niagara!” when she saw them. 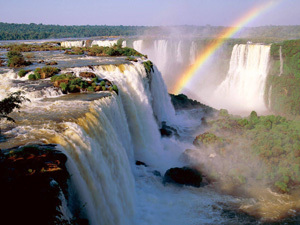 Comparable to the other great falls of the world, Iguazu fails to win any titles because of its fragmented nature, but its huge scale is certainly one of the natural wonders of South America.